How Do I Enable PayPal Express Checkout on my 3dcart Store? 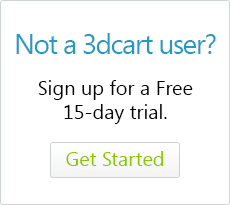 This article will show you how to integrate PayPal Express Checkout into your 3dcart store. PayPal Express is automatically enabled when using PayPal Payments Pro, and PayPal (Powered by Braintree). The purpose of this article is for individuals who would like to integrate PayPal Express as its own stand alone payment module. This will take you to the area of the Online Store Manager where you can add or review your store's payment modules. Along the top of the page, you will see pre-installed payment modules within a section labeled "Recommended Payment Solutions." Further down the page you will see a section labeled "Payment Methods" where you can manually install payment modules. Look towards the top right of the Payment Methods section and click on the "Add New" button. A small popup window labeled "Add New Payment Method" will appear with your preliminary settings. In the Payment Method field, scroll down to the "Alternative Payments" section and choose PayPal Express Checkout. Select the Country and State you would like this payment method to apply to. Choose the Minimum and Maximum order amounts this payment method will apply for. Choose the Customer Group you would like the payment method to apply for. Click on the "Add New" button to install the module. The payment method will now be added. Your next step is to configure its account settings. Look for the payment method in your list, then look to the far right of it and make sure its toggle is turned to the "On" position. Type in the email address associated with your Paypal account in the "PayPal Email" field. Select this option if you have reference transactions enabled on your PayPal account which can be used with 3dcart's AutoShip add-on. Normally, when the customer is redirected to PayPal and logs into their PayPal account, their address information is retrieved and automatically added to the checkout on your store. Marking this checkbox will make it so that the address information is not retrieved thereby requiring the shopper to manually add it on the page during checkout. Marking this checkbox will make it so that your shopper can complete the checkout process on PayPal's side but without having to create or log into a PayPal account. Select this option to offer PayPal Credit to your shoppers as they purchase from your store. Click here for details. Once you are done with your settings, click "Save" at the top right to commit your changes. Your store is now set up to take orders using PayPal Express Checkout. In previous versions of PayPal Express, the customer would be redirected (from your store), to the PayPal Express login pages to complete their transactions. In the current version of PayPal Express, the customer is no longer redirected back and forth. Instead, a popup window will appear for them that lets them log into their PayPal Account and complete the transaction. The advantage is that - visually - they are not being directed and redirected to and from your store but rather appear to never leave your store at all. If your store's PayPal Express option is still redirecting customers in the old fashion, then you likely have customizations to your view cart and checkout templates that are not favoring the new functionality. For more information on how to update your template files to the latest version, please click here.